The Yoder came up to 235 in about 15-20 minutes, and it was ready to roll. The ribs used for this guide were 2.5 lbs baby backs. If you are not familiar with trimming ribs yourself, ask your butcher to square the racks on each side and remove any fragments left from the processor. To prep the ribs competition style, slather with a little mustard and apply a layer of Killer Hogs The BBQ Rub. You can use any other BBQ rub you prefer. Preheat your smoker to 235°F and place your ribs on the pit. Make sure temperatures are stable, and aim for a light blue smoke. After about 2 hours the ribs should have the color you want- time to wrap! Use a good dose of margarine, brown sugar, & honey inside the foil, and place back on the smoker to tenderize. 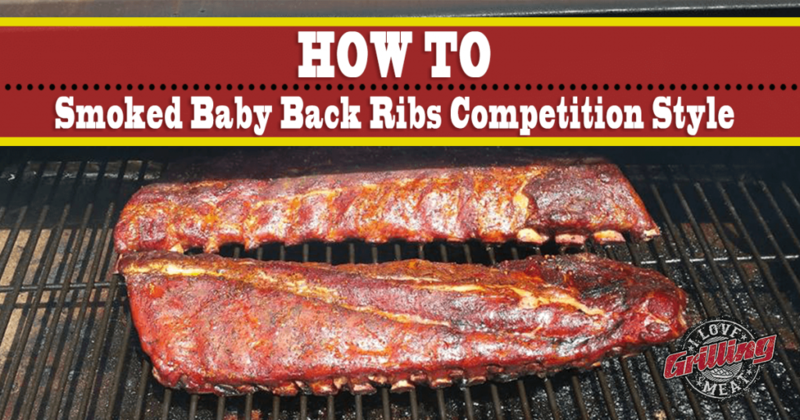 Check the ribs about 1 ½ hours into the wrap stage just to get a feel for the tenderness. If the ribs still needed a little longer, give them 30 more minutes. When they are ready, take them off the pit, vent and drain the juices from the foil to stop the cooking process. …and that’s why it’s time to glaze the ribs! For the final glaze, use a BBQ sauce of your preference. The one used for this guide is the Killer Hogs The BBQ Sauce, as it enhances not just flavor but also the final appearance of the meat. Once both sides were sauced, place the smoked baby back ribs back on the smoker. Keep a close watch on the ribs, checking them every 15 minutes for darkness. Once the glaze has set, pull them off the pit again, and let them rest for 10 minutes before serving.